This article mainly focuses on how to manage Database transaction while working with the MySQL database in Python. Let see Python MySQL transaction management using commit and rollback in detail. 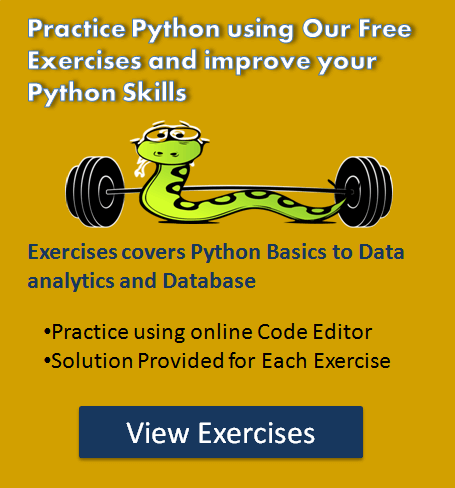 Solve our Free Python Database Exercise to practice and master the Database skills in Python. 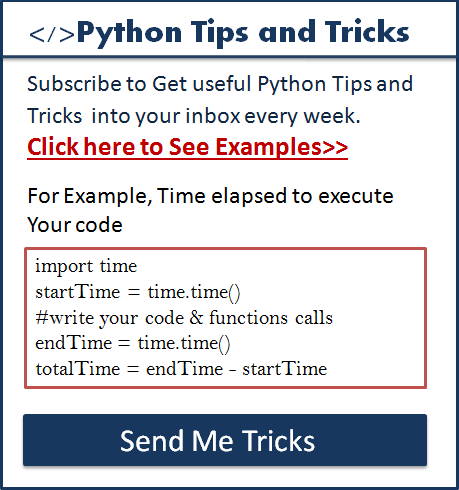 Also, Solve our Free Python Database programming Quiz to test your Python database concepts. Database transaction represents a single unit of work. Any operation which modifies the state of the MySQL database is a transaction. Let see in detail what is database transaction. For example, take an example of Bank amount transfer Transaction, it involves two major transactions. If the first Transaction is executed successfully, but second failed, in this case, we need to re-deposit money back to account A. To manage such cases we need transaction management. Using ACID properties, we can study transaction management well. ACID stands for Atomicity, Consistency, isolation, and durability. Atomicity means all or nothing. Either all transactions are successful or none. You can group SQL statements as one logical unit, and if any query fails, the whole transaction fails. Consistency ensures that the database remains in the consistent state after performing a transaction. Isolation ensures that transaction is isolated from other transaction. Durability means once a transaction has been committed, it persists in the database irrespective of power loss, error or restart system. Note: We are using MySQL Connector Python module in our example. Create MySQL database connections in python. Prepare the SQL queries that you want to run as a part of a transaction. For example for bank transfer, we can combine two SQL queries(withdrawal money and deposit money query) in a single transaction. Set an auto-commit property of MySQL connection to false. If one of the queries failed to execute rollback all the changes. Python MySQL Connector provides the following method to manage database transactions. commit – MySQLConnection.commit() method sends a COMMIT statement to the MySQL server, committing the current transaction. rollback – MySQLConnection.rollback revert the changes made by the current transaction. AutoCommit – MySQLConnection.autocommit value can be assigned as True or False to enable or disable the auto-commit feature of MySQL. By default its value is False. Once the program completed executing the query with your changes and you want to commit the changes to the database, then you need to call commit() method on MySQL connection object as follows. 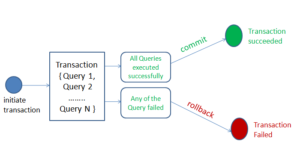 When one of the transaction fail to execute, and you want to revert or undo all your changes, then you need to call a rollback method of MySQL connection object as follows. sql_update_query = """Update account_A set balance = 1000 where id = 1"""
sql_update_query = """Update account_B set balance = 1500 where id = 2"""
You should get the following output if query executes successfully. You should get the following output if a query fails to execute. We imported the MySQL connector python module so we can use its API to communicate with MySQL Database. After a successful MySQL connection, we set auto-commit to false, i.e., we need to commit the transaction only when both the transactions complete successfully. We prepared two update SQL query as a part of a single transaction to deposit money to account B from account A. We executed both the queries one by one using a cursor.execute method. We placed all our code in “try-except” block to catch the database exceptions that may occur during the process. Thank you. Folks Let me know your comments and questions in the section below.